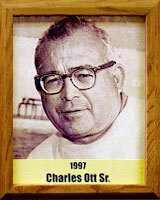 A member of a Tucson pioneer family, Charlie was born in Tucson in 1915. He graduated from Tucson High School in 1936 where he played varsity football for three years and was a member of the All-State football team his senior year. Charlie graduated from the University of Arizona in 1941 with a B.S. in physical education. He played football at UA, lettering in 1938. He received an M.A. in Education in 1951 from Arizona. He was hired by “Pop” McKale in 1941 as trainer, physical education instructor and coach, a career at the U of A that spanned 38 years. After sabbatical study at USC, Charlie developed and headed the recreation curriculum in the H.P.E.R. department at Arizona. He also started and ran a faculty and staff summer swimming program at Bear Down Pool where he taught countless kids to swim. He retired in 1979. Charlie served as a Water Safety and First Aid Examiner for the American Red Cross for many years. In 1980 he received the Community Service Award from the YMCA Aquatic Officials Association for his contribution to the swimming community of Pima County.